The Vol Navy will need to dock early this weekend to take full advantage of all the fireworks, football, food and music being served. It’s hard to imagine a college freshman passing up her first opportunity to spend a weekend at home. But when Boomsday is on the schedule, laundry can wait. “I’ve stayed for Boomsday since freshman year, even though it’s the first weekend you can go home,” says Carrie Bowman of Hendersonville, who graduated from the University of Tennessee last spring with a degree in speech pathology. Now a UT grad student studying therapeutic recreation, Bowman is once again making plans to hang with her Alpha Omicron Pi sorority sisters at Boomsday on Saturday and cheer on the Vols in the first game of the season against Utah State Sunday night. “The fireworks are great, there’s always music and it’s a big weekend for everybody to get together,” Bowman said. Visit Knoxville, the Knoxville Convention and Visitors Bureau that coordinates Boomsday every year, partners with the city, Journal Broadcast Group, WBIR, Knoxville News Sentinel, Comcast and many others in the community to pull off the biggest Labor Day weekend fireworks show in the country. Planners make sure there’s something enjoyable from the youngest attendee to the oldest. 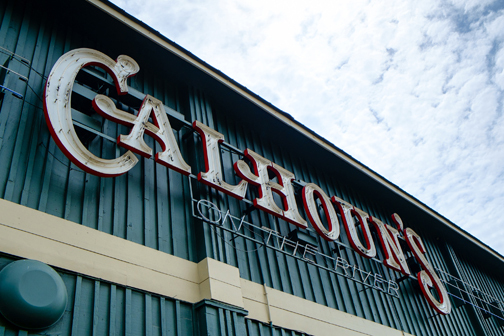 Calhouns at Volunteer Landing will host a fundraiser benefitting breast cancer research on Saturday, 4:30-6:30 p.m. It’s also a great location for watching fireworks later in the evening. Local food and drink vendors will be out in full force during the Boomsday festival, but for anyone planning on making it a nice long weekend, we asked Bowman and other Knoxville residents about the best places for visitors to eat, shop and have fun. Truffle-parmesan fries, anyone? This Market Square eatery serves up comfort food with a twist, right in the center of the action. Cap off roasted artichoke flatbread or the salmon-beet salad with warm peach crisp or the cupcake of the month. If lobster crepes and caviar deviled eggs aren’t your thing, check out the Sunday brunch, which is likely to include everything from bananas foster to biscuits and gravy. Locally sourced and seasonal are the buzzwords for this food truck. Follow them on Twitter @savoryandsweettruck to find out where you can order up delicacies like smoked Tennessee pork tacos or peaches and cream French toast. Yes, yes, the ribs, but have you tried their banana pudding? It will become your new favorite thing in life, after UT football, of course. 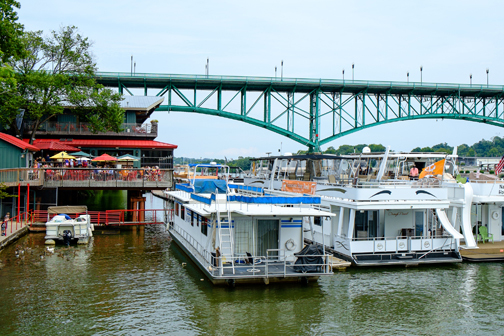 For Boomsday, they’re hosting the Vol for Life ticketed event to benefit breast cancer research from 4:30-6:30 p.m., and you can stay for the best vantage point on the river to watch the fireworks. So Southern you’ll develop a drawl. The award-winning restaurant that started in Asheville, NC, is known for its fun take on Southern classics. Think fried green tomatoes over goat-cheese grits with basil or nut-crusted fried chicken with mashed sweet potatoes. It’s also green-certified and offers gluten-free options.